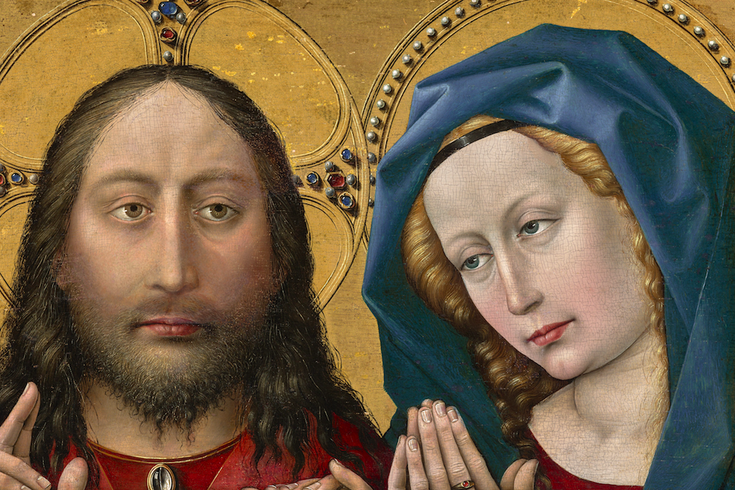 "Christ and the Virgin," circa 1430-1435. Robert Campin, also called the Master of Flemalle, Netherlandish (active Tournai). Oil and gold on panel, 11 1/4 x 17 15/16 inches. Philadelphia Museum of Art, John G. Johnson Collection, 1917. “How do you fit three kids in this house?” whispered one Philadelphia Museum of Art security guard to another, in the first room of the museum’s new exhibition – Old Masters Now: Celebrating the Johnson Collection. It is indeed a mystery how esteemed Philadelphian lawyer and art collector, John Graver Johnson, squeezed both his family and his collection of 1,279 paintings, 51 sculptures and 150 art objects into the four-story Frank Furness-designed townhouse that once stood at 506 South Broad St. But a blown-up photograph of his home’s interior provides a clue: paintings were mounted floor-to-ceiling, and more stacked against the walls. Rumor had it there were Chardins in the boot closet and Manets in the servants’ stairway. With his photographic memory, Johnson knew exactly where every work was located. His collection is displayed and treated quite differently now, and that’s a big part of the point of this exhibition, opening Friday at the Philadelphia Museum of Art. Celebrating the centenary of Johnson bequeathing his collection to the Philadelphia public, the exhibited selection of roughly 100 paintings from his collection in Old Masters Now demonstrates what museums can do for art collections (that private collectors can’t). Inside John G. Johnson's mansion on South Broad Street, circa 1936. “Old Masters Now looks at an extraordinary Philadelphian and how we, as museum staff, study and care for his remarkable collection today,” says Jennifer Thompson, the curator of European painting and sculpture at the art museum. Eight highlighted paintings put the museum's behind-the-scenes research on view, almost as much as the artwork itself. These paintings are accompanied by X-rays that show previous versions of the works, magnified paint samples used by conservators, ground-up materials used as pigment sources, and photographs of conservation in progress. “The Last Drop” (The Gay Cavalier), c. 1639. Judith Leyster, Dutch (active Haarlem and Amsterdam). Oil on canvas, 35 1/16 x 28 15/16 inches. Philadelphia Museum of Art, John G. Johnson Collection, 1917. One such highlight is "The Last Drop" (The Gay Cavalier) by Judith Leyster, a 17th century Dutch painter. When Johnson purchased it (and later, when the museum received it), it depicted two young men having too much to drink. A Leyster scholar, Frima Fox Hofrichter, approached them years ago to say that she believed part of the background had been painted over (and not by the artist). After the museum’s director of conservation, Mark Tucker, performed multiple X-rays and some microscopic cleaning tests, they found out that Hofrichter was right. 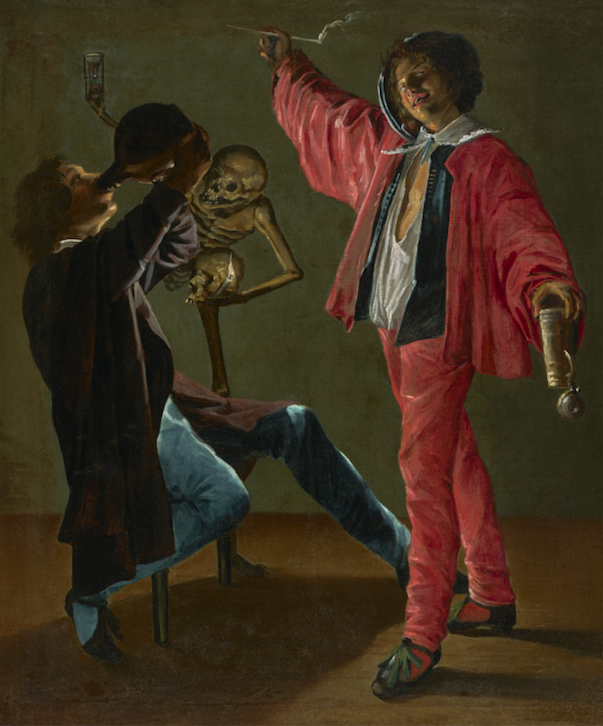 A full skeleton was hidden in the background between the two figures, holding a candle and an hourglass as a warning of the dangers of excessive drinking. 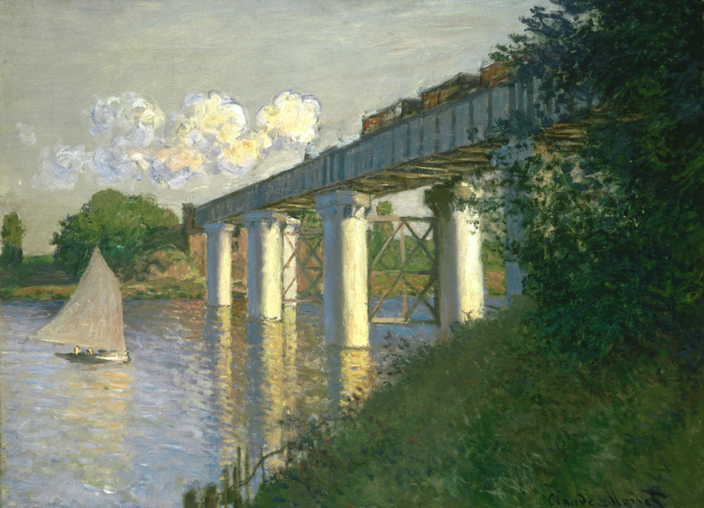 “Railroad Bridge, Argenteuil,” 1874. Claude Monet, French. Oil on canvas, 21 3/8 x 28 7/8 inches. Philadelphia Museum of Art, John G. Johnson Collection, 1917. “It was painted over at the behest of a dealer, to make it a consequence-free scene of revelry,” Tucker explains. He has since restored the painting to the artist’s original intention. Such discoveries would probably not be made were the collection to remain at the Johnson residence. But the home he envisioned was at 506 South Broad Street (not 2600 Benjamin Franklin Parkway). 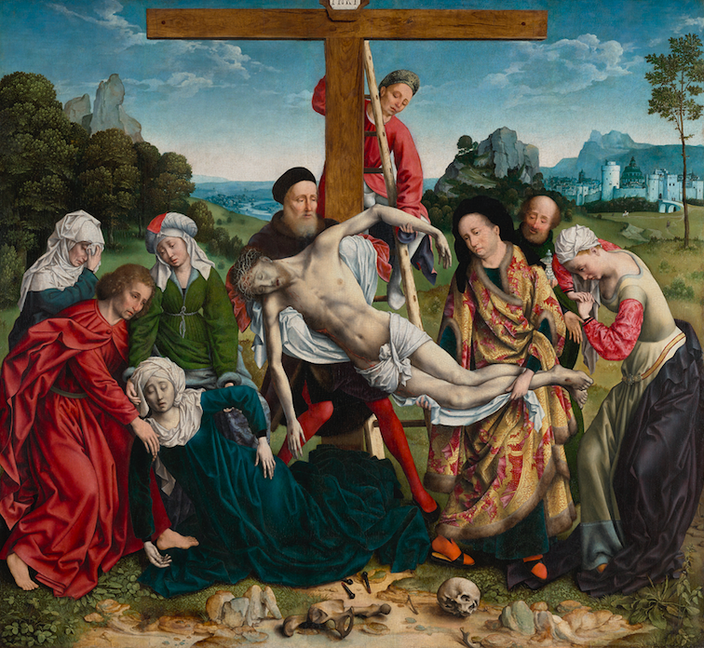 “The Descent from the Cross,” c. 1518-1520. Joos van Cleve, Netherlandish (active Antwerp and France). Oil on panel, 45 1/4 x 49 3/4 inches. Philadelphia Museum of Art, John G. Johnson Collection, 1917. 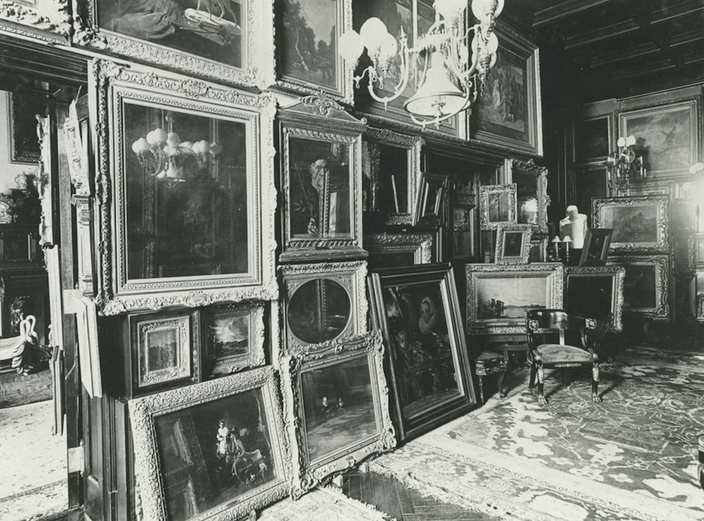 From the time of his death in 1917 until 1933, the collection was publicly accessible on South Broad, but then moved to the Philadelphia Museum of Art due to determination by a court-appointed master that the townhouse was unsafe for the collection. It has been continuously displayed there ever since, and in addition to the nearly 100 paintings on view in Old Masters Now, there are around 300 additional artworks from the Johnson collection displayed in the museum’s other galleries. Its address has changed, but Tucker believes that the underlying attitude towards the collection has not. “The traditional connoisseur’s eye has been both tested and sharpened by the tools of examination we have now,” he said. Old Masters Now: Celebrating the Johnson Collection will be on display Friday, Nov. 3 through Feb. 19, 2018 at the art museum.